Simple, delicious elegance – that’s what this dish offers. We’re often intimidated by the notion of “soufflé,” and its reputation, but it’s not that difficult. With just a couple of tips and a little mindfulness, this classic dish can be mastered. A savory soufflé such as this one, is light and airy, yet, at the same time, possesses a richness in every bite. 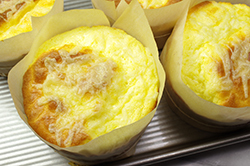 The aged Swiss cheese, Gruyère, is the traditional choice; it’s subtle tang melds perfectly with the airy egg base. As an aged cheese, it falls into the semi-hard cheese category – not too firm, not too soft, but meltingly perfect for showcasing in this baked dish. For a variation, try an aged, sharp cheddar cheese. 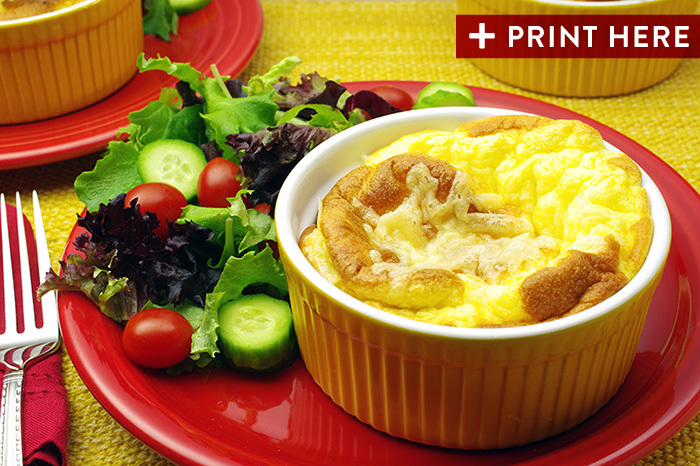 Serve with a salad of greens for the perfect brunch or lunch plate. (1) Preheat the oven to 400°F. Prepare a 1.5 quart soufflé dish (or 4 individual 8 ounce ramekins) by greasing the inside of the dish with a bit of butter. Add the finely grated Parmesan cheese to the dish, and shake to evenly distribute the cheese along the bottom and sides of the dish. Tap out any excess cheese. Add a collar of parchment paper and tie with a length of kitchen string. (2) Begin the base with a roux. 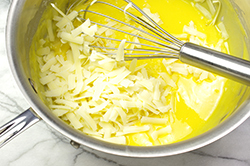 In a medium saucepan, melt 3 tablespoons of butter, add 3 tablespoons of flour. Cook for 2-3 minutes while continuously stirring. 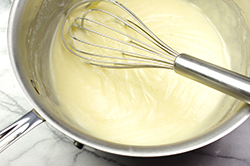 The roux will form with the appearance of a thick paste, and any raw flour taste will dissipate. 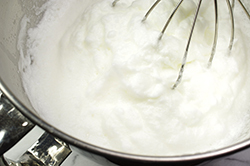 Add the milk gradually while continuing to whisk. Add the salt and cayenne, and continue stirring until the mixture becomes thickened. Remove from heat. 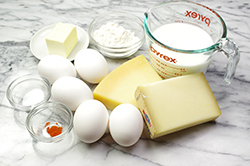 (3) Separate the eggs; place the egg whites in a large, clean, grease-free mixing bowl. 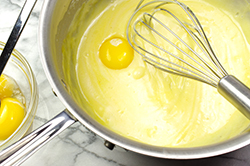 Add the egg yolks to the thickened roux one at a time, whisking well after each addition. 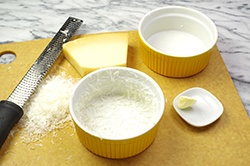 (4) Add the grated Gruyère cheese (reserving a few shreds for topping) to the base mixture and stir until melted. Allow to cool slightly from a hot to a warm temperature. Transfer the mix to a large mixing bowl. 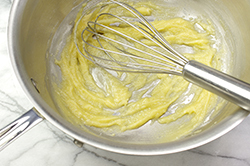 (5) Beat the egg whites with a hand mixer, or with the whisk attachment of a stand mixer until stiff peaks form. (6) Lighten the egg yolk base by transferring about a quarter of the egg whites to the base mixture, and gently folding them in until evenly distributed. 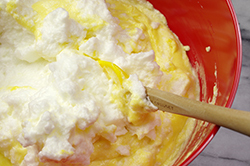 Add half of the remaining egg whites with a gentle folding motion, and repeat with the remaining half. Take care to maintain the airy nature while folding and mixing. 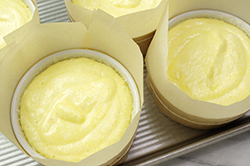 (7) Transfer the mixture to the prepared soufflé dish (or the individual ramekins) and carefully place in the oven. Reduce the heat to 375°F. Bake for 25-30 minutes (20-25 minutes for individual dishes) or until set and edges browned. The center should be cooked but may remain a bit wiggly. DO NOT OPEN the oven door for the first 20 minutes! The change in temperature may cause the soufflé to deflate prematurely. 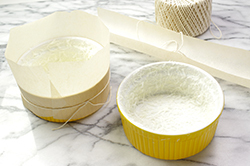 (8) When the baking is nearly complete, sprinkle the remaining shreds of Gruyère cheese on top and return to the oven for an additional 2-3 minutes or until the cheese is nicely melted. Serve promptly.